Spammy and malicious calls are a serious annoyance, and even a danger for some Android owners. Iffy calls can cost you your time, your sanity, and in some cases, even your personal data or your money, thanks to a number of phone-centric exploits out there. Luckily, there are apps in the mobile space that can help with this problem, blocking suspicious calls and texts to keep you safe and sane. This Top 10 list focuses on apps that can help you clear the clutter, and even protect you from threats. 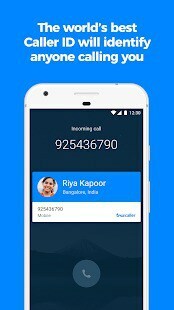 Truecaller tops this list for a number of good reasons, chief among them is that the download numbers don’t lie; this app has been downloaded in excess of 100 million times. The rich feature set is a big part of the reason that it’s managed to rack up so many downloads. That feature set consists of both manual and automatic call blocking, smart caller ID with a growing, community-maintained database, and even dual SIM support. There are in-app payments to unlock extra features, such as an SMS blocker, and users in India can even use the app to manage UPI payments. Mr. Number has been around for a while, and is the recipient of multiple app awards. 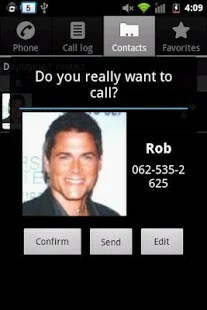 It’s the top smart caller ID-focused app out there, and boasts a massive community effort behind its large database of fraudulent and spammy phone numbers. It can deflect calls to voicemail automatically, though it doesn’t have the power to keep you from receiving spammy voicemail messages. It also gives you the ability to see names and photos in your call history, and can even identify businesses and other entities, in most cases, even if they’re not fraudulent. Hiya comes from the makers of Mr. Number, and the totally free, ad-free app with no in-app purchases provides much of the same functionality. You’ll be able to draw on a community database and your own custom set of numbers, and even set up automatic blocking options. The rather simplistic app is not as full-featured as its sibling, but since it’s completely ad-free and in-app-purchase free, you can’t really expect a lot. Even so, it’s garnered tens of millions of downloads and currently holds just above a four-star rating in the Play Store. This app, bearing a respectable 5-plus million downloads and four and a quarter star rating, is essentially much like the other apps on this list so far. The big difference is that it’s less intrusive, and the automatic blocking and the app itself can be set up seamlessly. That automatic blocking not only includes known spammers and scammers, but also violators of the national Do Not Call list. There’s also the fact that you can set up designated hours where you don’t want to be disturbed, a useful feature for older devices that may not have updated to Android 6.0 Marshmallow and gotten the feature from Google just yet, and may not ever. This rather simple and aptly named app can be prone to random bugs, according to reviews in the Play Store, but it’s frequently updated and the developer is hard at work fixing those bugs. That’s how it’s managed to come close to a 5-star rating in the Play Store, among over 5 million downloads. The app is light on resources and easy to use. 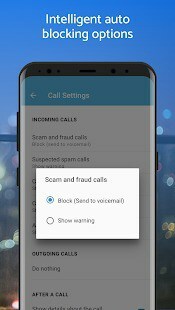 You can choose from four modes; the app can block calls from a blacklist that you populate, block all calls except for a whitelist that you populate, block calls from anybody not in your contacts, or simply block all calls. 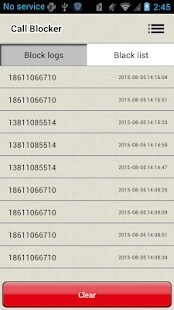 There’s also a log showing calls that have been blocked. 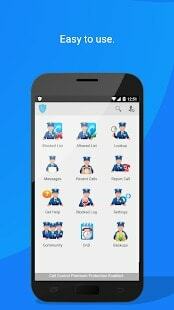 This is another highly-rated, aptly-named app that does exactly what it says it does. This one is not a traditional blocker, but instead shows you a rating for each number when they call, if the number is in its database. Numbers stored in your contacts are exempt from this treatment, it’s worth noting. The point is to point out potentially unwanted, dangerous, scammy or even expensive calls, protecting you from unwittingly answering a long-distance collect call set up on a throwaway debit card, for example. You can write your own reviews for each number that calls you, as well. As icing on the cake, it also works offline. 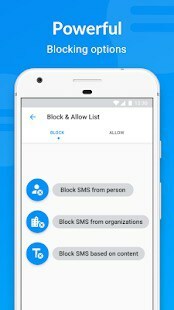 This highly-rated call and SMS blocker features a number of ways to add numbers to your blacklist, as well as a few unique features. As well as blocking known spam and scams, it also matches other apps by allowing users to block private numbers and unknown numbers. This one also allows you to block numbers in ranges using a modifier for how the number may begin,which will frustrate robocallers and spammers using VOIP systems to spoof a unique number for each call. You can also schedule blocking, get notifications, and save a log. 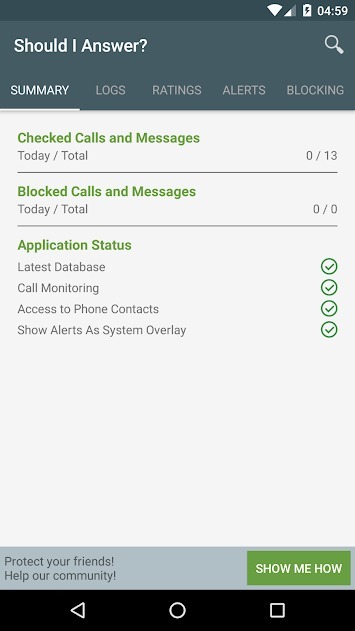 This app offers all of the basics of a call blocking app, including detailed caller ID and blocking calls from anonymous and known spam callers. It’s easy to operate, light on resources, and even totally free to you and ad-free. You can even launch FTC complaints and get help from a call center employee if necessary. The only catch to all of this? It’s an exclusive Tracfone app. Anyone who’s not a customer of Tracfone or a related MNVO such as Walmart Family Mobile will get a “lite”, stripped-down version, but it’s still free of cost and ad free. This app does exactly what its name says and it does it fairly well, if its three and a half star Play Store rating and one hundred thousand plus downloads are any indication. It’s unique in that function; rather than blocking incoming calls, it keeps you from making calls that you don’t want to make. 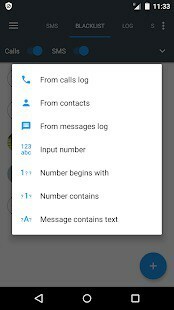 It can block outgoing calls outright, block outgoing calls to certain numbers, or simply have you confirm if you want to make a call, great for frequent pocket-dialers and those who often hand their phones to others. It’s worth noting that the app’s full capabilities, which include locking outgoing calls with a passcode and shaking to confirm an outgoing call, are locked behind a paywall. 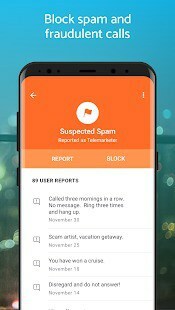 Spammy and dangerous contact comes in many forms, and this app is for people who have more trouble with SMS messages than with calls. It’s got a high rating and an award from MIT. It can block and remove SMS messages that are spammy, come from unknown numbers, or come from outside your circle of contacts. It also has an optional dark theme for AMOLED screens, tabs and grouping for SMS messages, and dual SIM support. 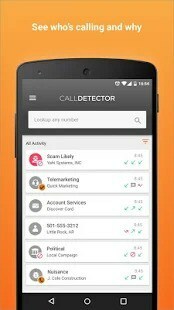 The post Top 10 Best Android Apps — Call Blocking — July 2018 appeared first on AndroidHeadlines.com |.